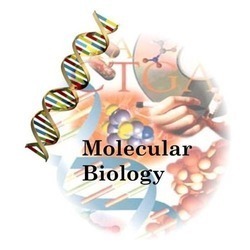 Molecular biology is the study of biomolecules like DNA, RNA and protein. The area interknits with the other areas of biology, Chemistry, Biochemistry and Genetics. However, Biochemistry is the study of chemical molecule and vital processes occurring in organisms. Biochemists mainly focus on role, functions and structure of biomolecule. Genetics is the study of effect of genes on living organisms and asks for understanding the process of trait inheritance from one generation to next generation, including the molecular structure and function of genes, gene behaviour in the context of a cell or organism, gene distribution, and variation and change in populations. The problems related to molecular and cell biology including structural and functional genomics, transcriptomics, proteomics, bioinformatics, biomedicine, molecular enzymology, molecular virology and molecular immunology, theoretical bases of biotechnology, physics and physical chemistry of proteins and nucleic acids are covered by molecular biology. Molecular biology deals itself with understanding how various system of cell ( DNA, RNA and Protein synthesis) interacts with each other and how these interactions are regulated. It is used to examine expression of gene like when and why genes are switched ‘on’ or ‘off’. The central dogma is the key principle of Molecular Biology. Central dogma means DNA is transcribed into RNA, RNA translated into protein. There are some techniques used in Molecular Biology. These techniques are gel electrophoresis, PCR (polymerase chain reaction), ligation, blotting and cloning. These techniques used in preparation of vaccine, production of drugs and biotechnological fruits, and plants. Gel Electrophoresis:- This is one of the most important technique used in molecular biology to separate DNA, RNA and protein according to their charge and size by applying electric field. A definite advantage of gel electrophoresis is its preciseness due to its high resolution power. Blotting:- Blotting is done to separate DNA, RNA and proteins through slab of gel. The smaller molecules move faster than bigger one through gel. The separated molecule is then pressed on membrane and it helps move molecule from gel on the membrane. There are mainly three blotting technique used in molecular biology like western blotting, southern blotting and northern blotting. PCR (Polymerase Chain Reaction):- It is an enzymatic method by which millions of copies of a discrete sequence of DNA or RNA are synthesized. This method has become popular day by day in areas of biological and medical research and diagnosis. Cloning and Ligation: – In molecular biology, the precise assembly of DNA is a critical technique. Cloning is a method in which cutting of DNA strand is done by restriction endonuclease ( it cuts the DNA at specific sites ). After cutting the DNA strand, ligation step comes and this involves the the formation of phosphodiester bonds between adjacent 5′-phosphate and 3′-hydroxyl residues, which can be catalyzed by different ligases enzyme. 1) H.R. Maurer. book. Disc and related techniques of polyacrylamide gel electrophoresis. 2) David H. Nguyen. 2017. Biochemistry blotting techniques. 3) Corinne D. Boehm. Use of polymerase chain reaction for diagnosis of inherited disorder. 4) Julian Stevenson, James R. Krycer, Lisa Phan, Andrew J. Brown. A practical comparison of ligation- independent cloning techniques.